Happy October!! I can’t believe it is here already, but I am not complaining, since it is one of my favorite months of the year. My favorite baking season definitely, with all those scrumptuous pumpkin recipes. I can’t wait for my house have that fall baking aroma. So, I am sure you are wondering why, on this first day of October, I am posting a Cucumber Cooler? Well, I just couldn’t get into fall just yet without posting one more cucumber drink. I saw this drink in Bon Appetit called Ruben’s Cooler No. 2, which I adpated heavily to create this new drink called the Cucumber Cooler. I had all the intentions of following the recipe exactly, until I got to the liquor store. I saw this Cucumber Liquor, and I couldn’t pass it up. It actually tastes good enough to just serve by itself on the rocks. 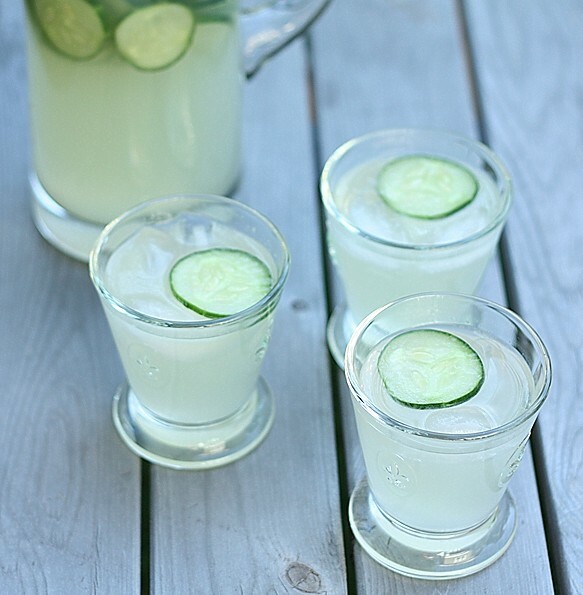 So – here I am, toasting to the end of summer, and the beginning of fall, with my beloved Cucumber Cooler – cheers! Line a large rimmed baking sheet with parchment paper. Arrange cucumber slices in single layer on prepared sheet. Freeze until solid, about 1 hour. DO AHEAD Can be made 2 days ahead. Cover and keep frozen. Combine gin, liqueur, lemon juice, and 2 cups ice in a large pitcher. Cover and refrigerate until chilled, about 2 hours. Stir club soda and frozen cucumber slices into pitcher. Fill 12-ounce highball glasses with ice. Pour cocktail into glasses and serve. Love this drink! Cucumber is so refreshing and the taste is like a cleansing agent doing its thing in your mouth. I’ve tried it and I used the leftover as ice cubes, and used it for my lemonade…Loved this drink more! I love a cool refreshing cucumber cocktail! I like to puree the cucumber and then strain the juice to really bring out its flavor. Sometimes I add jalapeno for a kick. I puree it with the cucumber to bring together the heat and the cool.